Now we head across the Esplanade to the Mouse-Next-Door, officially known as Disney California Adventure Park. The MND was built on what used to be Disneyland’s parking lot, and at its opening, some felt it was a bit of a disappointment. Now, however, the MND has undergone some big improvements and with the addition of a new land in the summer (Cars Land) and a revamped equivalent of Main Street, among other changes, the MND is set to become as seriously awesome place to go. That said, it’s already pretty awesome already. 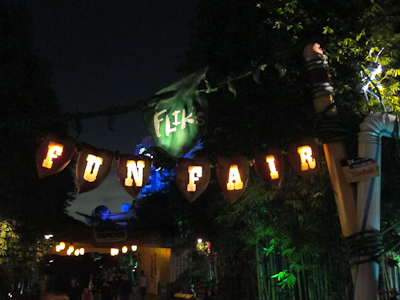 The best part, in my opinion which you are all here to read, is Flik’s Fun Fair. Flik’s Fun Fair, located in “a bug’s land” (and that’s how Disney capitalizes it–I’m not trying to be clever), is basically a kiddie area. 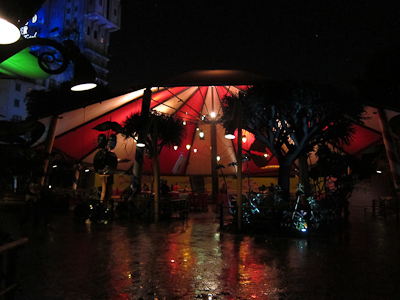 Now I know what you’re thinking–isn’t, like, DISNEYLAND a kiddie area? Well, yes and no. 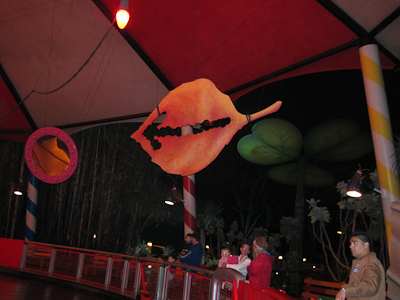 Over here in Flik’s Fun Fair, the rides are truly for the 7-and-under crowd. Which is nice when your kids is under 7.
okay, it’s just cool, all right? 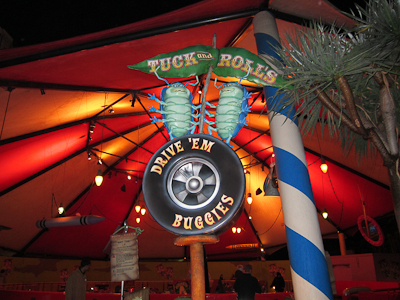 Anyway, over in Bugs Land is Tuck and Roll’s Drive ‘Em Buggies. Tuck and Roll’s are bumper cars. They live in a giant circus tent type thing. Your ride vehicles are little pill bugs, or rollie pollies, or however you want to spell and say those little bugs that roll up into a ball. Rollie pollies. Or is it Rolly Pollys? 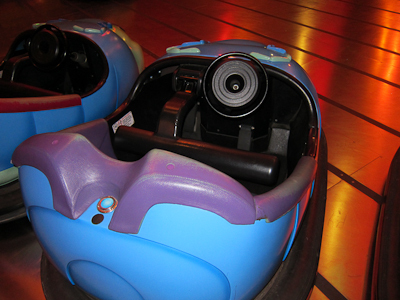 Now let me just take a moment to talk about bumper cars. Like, seriously. I’m thinking of the bumper cars that you find at carnivals and stuff. First of all, I hate whiplash. And that’s basically all bumper cars are–to give other people whiplash. Second, I hate being hit from behind when I don’t see it coming. Also whiplash. 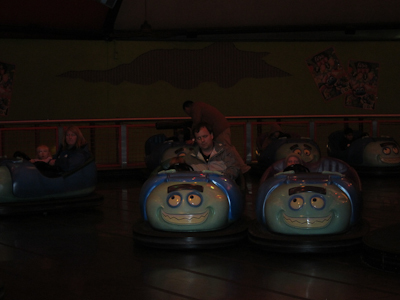 And thirdly, most bumper cars have that electricity thing going on where there’s like a metal electrical net on the top and the cars each have long sticks that connect to that and get their power from it. And the sparks and stuff always make me nervous and convinced that I’m going to die if something goes terribly wrong. Which is NOT a feeling I get on roller coasters, by the way. Go figure. 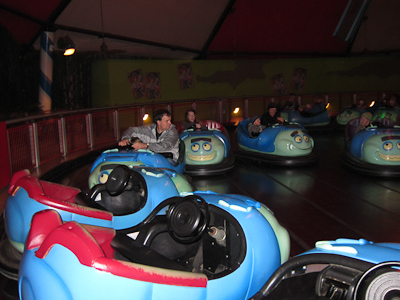 Anyway, so I hate bumper cars. 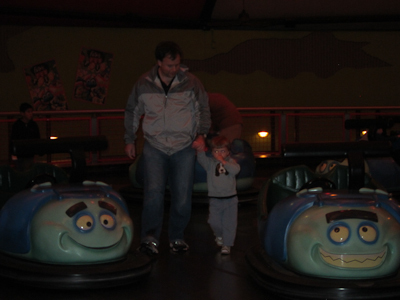 Luckily, Disney has solved my bumper cars problems. For one, there’s these giant squishy lap bars that are actually nice and comfortable. The second thing is–no more sparks, Sparky! These bad boys drive themselves. Once you get in them. And then the best part is the avoidance of something I forgot to mention above, which is this. In regular bumper cars, it’s easy to get all stuck in a corner and be battered mercilessly until your head falls off or whatever. Disney has solved this with the automatic back-up. If you are stuck somewhere and can’t move forward, simply turn the wheel all the way to one side, and after a few seconds your car automatically backs up and you can then steer it on course. 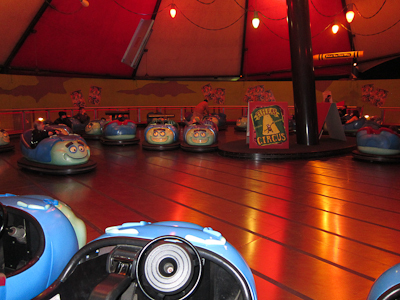 Rather than a free-for-all like most bumper cars, Tuck and Roll’s is a circular arena and the idea is for you to go one way–to the left. There are other helpful signs to guide you. 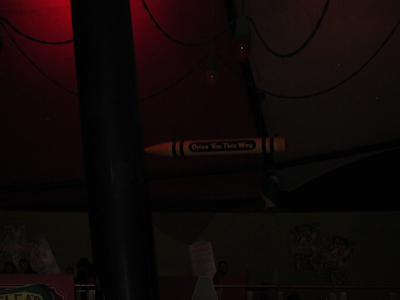 Mr. Blurry Crayon says "go left!" In an ideal world everyone would be going that way. But this is not an ideal world. This is Toddlerville. And in Toddlerville, sometimes you need Daddy to strong-arm you in the right direction. Maybe you’ll even make it all the way around! Or not. Either way, you still have fun. Theo had fun. But not so much fun that he wanted to go again. I like that it goes SO SLOW, that even when you do crash, it is very low impact.